It didn't seem like a really great meeting when Donald Trump met Obama in the White House but the potential for memes just couldn't be ignored. Have you been up at 3am tweet-shaming President Obama recently? Well, watch out, he sees you. Appearing on Jimmy Kimmel Live!, President Barack Obama took out an iPhone and participated in Kimmel's much-beloved Mean Tweets segment, fielding insult after insult on everything, from some bad shampoo to his choice of jeans. You think dealing with Putin's tough? Try sleeping after being called both the Nickelback of Presidents and the Sharknado of Presidents. Cold blooded. The final insult of the night came from, you guessed it, Republican presidential candidate, Donald Trump. Under the guise of his @realDonaldTrump handel, Trump lobbed 140 characters of fury at the commander-in-chief. To which Obama replied, "At least I will go down as a President." BREAKING NEWS: College kids like to play beer pong. A Snapchat image gathered by The Daily Caller appears to show President Obama's oldest daughter, Malia, playing a game of beer pong. The high school senior was reportedly attending a frat party at Brown University as part of her college touring process. But Malia might want to reconsider choosing Brown. The students there appear to be a bunch of snitches that have absolutely no chill. It has been noted on social media that everyone should calm down about Malia playing a game of beer pong. After launching his new show with a bevy of jokes on Donald Trump, Stephen Colbert decided it would be a nice idea to invite the GOP front running candidate for the presidency on The Late Show. So, Sept. 22, it happened. It certainly wasn't the best interview Colbert has had on his show so far, that honor goes to the the emotional chat with Vice President Joe Biden. But still it was a civilized conversation in which Trump still would not say whether President Obama was born in America. All in all, a solid night at The Late Show. Ever since the news broke about 9th grader Ahmed Mohamed getting arrested for bringing a homemade clock to school, #IStandWithAhmed has exploded and support has come from some very powerful people. First, the President complimented the clock and extended an invite to the White House. Then Facebook founder Mark Zuckerberg applauded Ahmed's ingenuity and desire to build. And also extended an invitation to the company. Support also came from politicians, comedians and businesses. President Obama has had a very strange relationship with salmon this past week. 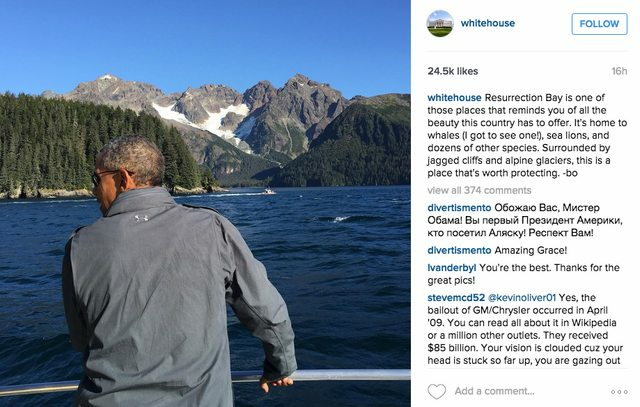 During a scheduled trip to Alaska to see the effects of climate change firsthand, Obama appeared on a taping of Running Wild With Bear Grylls. While many people hoped the duo would end up drinking each other's urine, they opted for something a bit more mundane—a leftover salmon carcass that an actual bear had left on the side of a river. This wasn't the first run in with salmon Obama had during his Alaskan adventure. Just days before this, a salmon spawned (if ya know what we mean) on the President. President Obama and Bear Grylls are basically besties now, and they've got the selfie to prove it. As part of Obama's three-day trip to Alaska to study the impact of climate change on the region, he is spending time with survivalist Bear Grylls and exploring the wild. @POTUS such special moments all through this journey. & what you are doing to help protect our planet is inspiring. 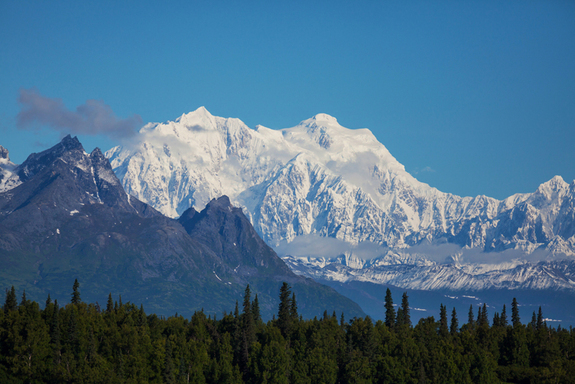 Ahead of Obama's trip, he finalized a name change of Mount McKinley. It is known officially known as Denali, the original name given to the highest point in North America by Alaskan natives. 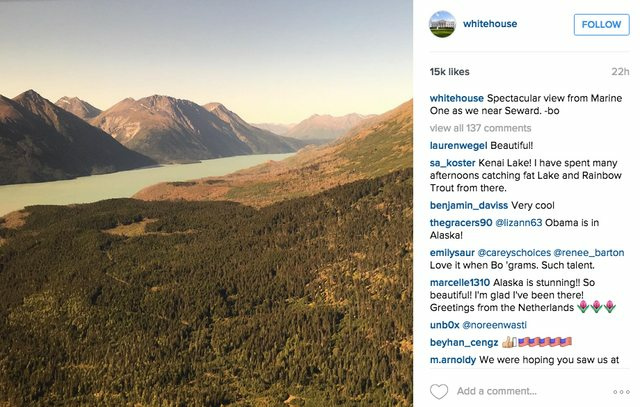 Since starting his Alaskan adventure, the White House Instagram has been posting other pictures of Obama in the wilderness. The President joins celebs like Kate Winslet, Zac Efron and Michelle Rodriguez appearing on Running Wild With Bear Grylls. President Obama is officially the #YOLO president. Ahead of his scheduled three-day trip to Alaska to see the effects of climate change, Obama announced that Mount McKinley, America's highest point, will now officially be known as Denali. The mountain was originally known as Denali by Alaskan natives before it was renamed to honor President William McKinley in 1917. But many Alaskans have continued to call it by its original name, and the state has been petitioning the federal government to change the name since 1975. Some Ohioans think this is a Miserable idea, since McKinley hails from the state. But this isn't even the craziest part of Obama's trip. NBC has announced that the president will film an episode of Running Wild With Bear Grylls. Obama will learn survival skills and talk about environment issues with Bear Grylls, the survivalist who has recently filmed with stars Kate Winslet and Michelle Rodriguez. No word yet if Bear plans on drinking Obama's presidential urine. Wouldn't you like to see the letters people send to President Obama? Well now you can see at least some of them. The White House launched a new Tumblr Aug. 20 with just that intention. It's called letterstopresidentobama and it will feature a selection of the correspondence sent to Obama's desk. Obviously, many, if not most, of those letters would be pretty critical of the President's executive decision-making, so you can't expect this selection to be altogether representative. However, as they say in the introduction, the hope is to bring attention to the views of some Americans. Today, the whitehouse is launching a new Tumblr account called "Letters to President Obama," where we'll highlight letters that Americans have written to the President. Follow along here. Below, Natoma Canfield – a cancer survivor from Ohio – shares what happened when she wrote the President a letter encouraging him to "stay focused" in his efforts to reform America's health care system. They then shared the letter of a cancer survivor and her appreciation for the President's commitment to affordable healthcare. It'd be super interesting to see the letters balance each other out, to give representation of this increasingly partisan country. Still, the fact that real people are writing real letters is news enough. President Obama's tech savvy staff want you to know the Commander in Chief is up on modern music, so they released his Spotify playlist Aug. 14. President hand-picked his favorite songs for a summer playlist. Take a listen to his 20 picks for a summer night. With that description, it's a little strange that the first song listed is John Coltrane's My Favorite Things. Don't get me wrong, this is actually one of my personal favorite Coltrane songs, but it's most definitely a Christmas-time song, right? Things pick up a little bit, getting way more modern with a Beyoncé track from her newest album featuring the incredible Frank Ocean. It's an eclectic list of oldies and contemporary-ish songs from a broader variety of artists that we would expect. There's Nina Simone, Erika Badu and some Miles Davis. Never would have picked Obama for a Leonard Cohen fan, either. That's some good taste. Things mostly stay at an easy, grooving pace with The Lumineers Stubborn Love as the wildest song on the list. The weirdest track to us is Frank Sinatra's The Best is Yet to Come. Nothing against Ol' Blue Eyes, it just doesn't seem to fit the rest. You can rock along to some presidential jams over here and tell us what you think about the President's musical tastes. President Obama knows that Donald Trump is probably stressing out over the Aug. 5 first Republican primary debate, so he decided to offer some advice. Jimmy Fallon's Donald Trump impression might be as weak as his ring finger, but the jokes that spring from this little interaction stand on their own. Plus, half the fun of watching a Jimmy Fallon impression is seeing how far away he can get from the real thing. This phone preparation covers a great many topics between the sitting president and the man who led the birther cause. They joked on Chris Christie, Trump got his own Cecil the lion trophy and the whole thing ended with an autotuned duet of OMI's Cheerleader. Trump's probably had a busy enough week, what with answering all those phone calls after his cell number went public. That surely won't stop the fireworks from blowing up in tomorrow's debate as the top 10 polled contenders for the Republican party nomination spar for a chance to say anything slightly meaningful in the most presidential way possible. President Barack Obama came back for the seventh time to The Daily Show July 21 before John Stewart takes his leave from the show after 16 years as host. A candid Obama answered Stewart's ongoing questions about the last year's continuing Veterans Affairs controversy, the Iran nuclear deal and senioritis in his last 18 months in the oval office. They also talked about Donald Trump's 2016 presidential campaign and shared thoughts on how to introduce more civic interaction. In one of the more striking uses of Obama's power, the president did threaten an executive order that would keep Stewart behind the desk of the The Daily Show, stopping Stewart's impending Aug. 6 departure. Stewart had to claim that it was more of a state's right issue and that he would still retire from the show. Obama's seven visits to The Daily Show has spanned almost the whole of his political career. He first showed up in 2005 while he was still an Illinois senator and would continue to stop by on election cycles and off. "You've been a great gift to the country," Obama said to Stewart at last night's appearance. Watch him react to a #ThanksObama and someone who does’t approve of his dad-jeans style.